Hey everyone. I'm Julie from White Lights on Wednesday. Back again to share another recipe with you - because Carrie and I just can't stay away from each other. :) She's kind of one of by blog girl crushes, just in case you didn't know Carrie. And in case you haven't heard, Carrie is going to be contributing for my blog starting this month. Be sure to stop by and see the fabulous cocktail recipes she's going to be sharing! 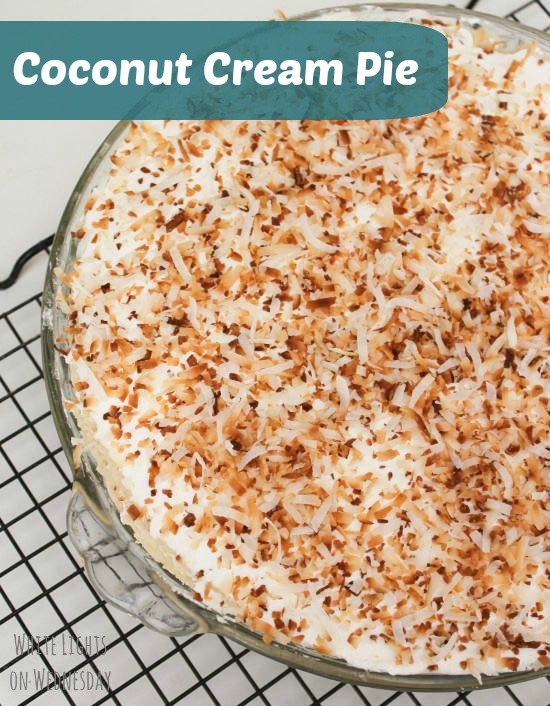 For Carrie's Pies in July week, I couldn't resist sharing this creamy, dreamy Coconut Cream Pie. 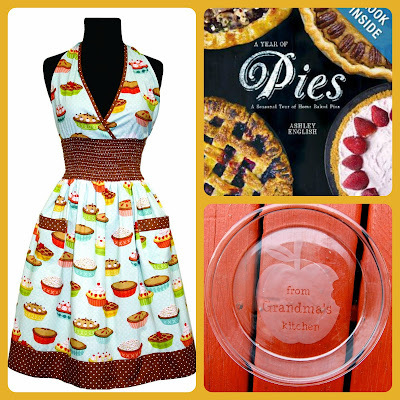 It's one of my favorite all time pies. Completely decadent and full of coconutty goodness - kind of like me. Sort of. And Don't forget to get yourself entered to win all the cute pie goodieness below in the Pies in July Giveaway! *This giveaway is open to U.S. residents only. All entries for the winner will be checked and verified, so please make sure you are doing what you are claiming in the Rafflecopter or all your entries will be voided. No funny business, folks. ;). By entering you give the right to use your name and likeness. Number of entries received determines the odds of winning. One winner will be selected. This is a giveaway sponsored as a group buy, which means the bloggers pooled their money together to purchase these products for you. Amazon & etsy are not sponsors of this giveaway. The prizes in this package will be ordered by Carrie of Frugal Foodie Mama and sent directly from Amazon & Hummingbird's View to the winner. Entries must come from your MAIN social media accounts, not accounts that have been set up separately just for entering giveaways. Entries from these types of accounts will be disqualified. Protected tweets do not count as an entry method for tweeting. Tweets must come from a public account. Bloggers in this group giveaway and their immediate family members in their household cannot enter or win the giveaway. No purchase necessary. Void where prohibited by law.